This "cable tree" commemorative of the 1858 Atlantic Cable is made from deep-sea, intermediate, and shore-end sections of the cable. The photograph on the left shows the display in its original condition; the photograph on the right shows the cable tree on display at the Science Museum, London, now missing several pieces. See full description below. 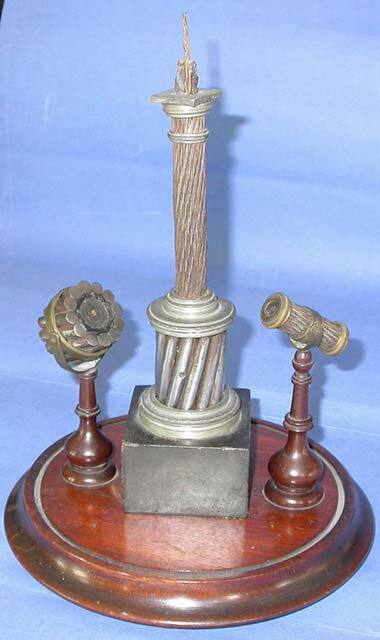 Cable ‘tree’, decorative souvenir of the 1858 transatlantic submarine telegraph cable, made by George Rapson, England, 1858-1865. 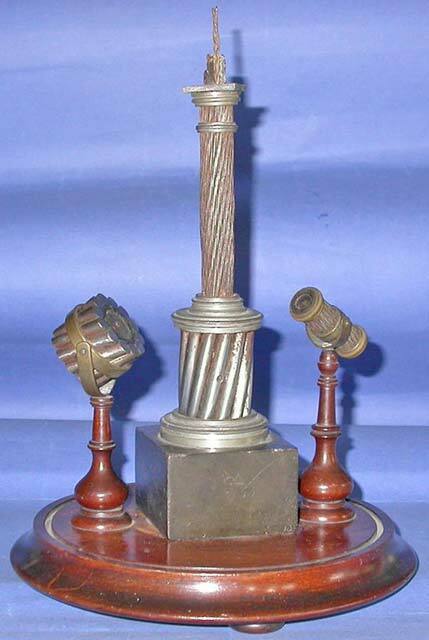 Five short sections of original cable mounted vertically and joined by brass shanks, with seven thin disks of cable (originally ten, three missing) suspended from the mounted sections, plus a model sailor (originally two, one missing) with three flags on top. Mounted on a velvet covered circular wooden plinth.